Whether on a local, regional, state or national level, when students attend a SkillsUSA conference or training event, they are stepping out of the bounds of comfort and expanding their horizons. SkillsUSA offers rich and meaningful opportunities for students to connect attending such activities with the development of the framework skills of personal, workplace and technical skills grounded in academics. 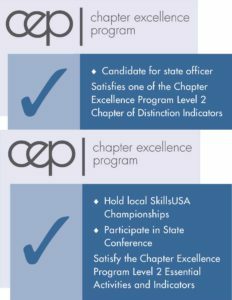 By participating in the activities outlined below, SkillsUSA chapters become conduits for meaningful student growth.